This is very tasty. It's also cheap to make but takes a wee while so it's worth doubling up the quantities to make a large batch - it freezes for up to 3 months so go for it. It isn't difficult but it's a bit faffy so get out all the ingredients and equipment first - it will streamline the operation nicely! Seitan - or gluten - is the original meat alternative. This tasty dish originates in China from the 6th century and was often eaten by vegetarian Buddhist monks, amongst others. It has since percolated round the Far East, eg Japan and Vietnam and is used in contemporary Western veggie and vegan food. It is made by washing wheat flour dough with water until all the starch granules have been removed. Buying vital gluten flour means the work has been done for you! High in protein, low in fat, and dense in texture, it lends itself to all sorts of dishes, including stir fries, 'steaks', rashers, deli slices for sandwiches, meat balls/chunks and more. Ready-prepared gluten flour (also known as vital gluten or vital wheat gluten flour) is available from some health food shops or else online from stores such as Veggie Stuff; Vegan X; Honest to Goodness and Realfoods (who sell an organic version). As you'll see, it's worth shopping around to get the best deal. It can be a very economical dish to make. There are several steps to this recipe; however, don’t be intimated because it’s actually very easy to prepare and the results are well worth the effort. For this recipe, two batches of dough are made to create the bacun. Dough 1 is for the darker marble layer and Dough 2 is for the lighter marble layer. Dough 1: use ½ medium onion, roughly chopped, any type. Cook it in a little oil until softened then blend it with the Dough 1 Liquid. Preheat the oven to 180°C/350°F/Gas Mark 4. Whisk together the dry ingredients for Dough 1 in a large mixing bowl. Stir together the liquid ingredients for Dough 1 in a separate bowl or measuring cup until the miso dissolves. Add the liquid ingredients to the dry ingredients and mix well to incorporate. Divide the dough into 3 pieces. Set aside. Whisk together the dry ingredients for Dough 2 in a small mixing bowl. Stir together the liquid ingredients for Dough 2 in a separate bowl or measuring cup until the salt dissolves. Add the liquid ingredients to the dry ingredients and mix well to incorporate. Divide the dough in half. Now you will begin the layering process which will create the marbling effect for the bacon. 1. First, tear off a large sheet of 18-inch wide heavy-duty aluminium foil and place it on your work surface. 2. Take a piece of Dough 1 and flatten and spread the dough on the foil until it is about ¼-inch thick. You don’t need to worry about the shape. 3. Next, using your fingers spread ½ of Dough 2 over the dark layer of dough. Flatten and spread another piece of Dough 1 over the light marble layer. Spread the remaining portion of Dough 2 over the dark marble layer. Finally, flatten and spread the last piece of Dough 1 over the top. You need it to look uneven, not too precise, or it will look machine-made! 4. Shape the dough into a rectangular “slab” about 1-inch thick. Once again, don’t worry about being too precise; the dough will expand during baking to conform to the shape of the foil package. Sprinkle the bacon with some coarse ground black pepper or smoked black pepper, if desired. 5. Wrap the slab of bacon in the foil (don’t roll), creating a flat package. Fold in the sides of the foil (like wrapping a gift), pinching to seal the foil as you fold. Do the same again with another sheet of foil - but make sure the pinched long edge is on the other side of the package to ensure a better seal. You don't want water leaking into the bacon, basically! Fill the roasting tray with about 2cm/generous 1 inch boiling water. 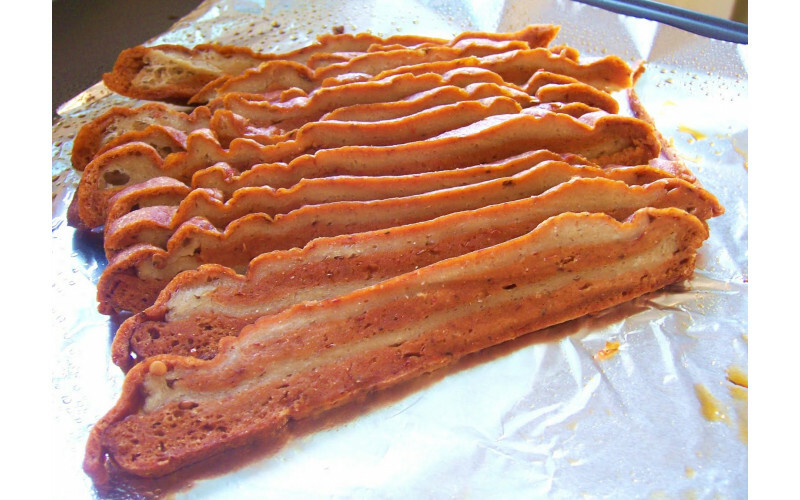 Place the packet of seitan bacon in the tray and bake for 60 minutes, turning once halfway through. 6. Cool the bacon in the foil until the package can be handled comfortably before opening. If it feels a bit damp, unwrap completely and place it on a cooling rack or an oven shelf propped up a bit. Slice thick for chewy bacon or thin for crispy. The rashers can be stored in the fridge for up to 10 days or in the freezer for up to three months. 7. Fry the rashers in a hot frying pan with a generous coating of cooking oil until lightly browned and crisp around the edges and drizzle a bit of shoyu or tamari over it just before removing from the pan. Avoid overcooking or the bacon will be dry and hard. Transfer to a plate lined with paper towels to blot any excess oil. Serve warm. It can also be chopped, diced or crumbled in recipes or layered in a sandwich.